Does my business have to offer health insurance to its employees? Not all companies are required to offer health insurance to their employees. Determining whether or not your company falls under this requirement is the first step to evaluating your ACA compliance. According to the employer shared responsibility provisions, which are listed under section 4980H of the Internal Revenue Code by the Affordable Care Act, all ALEs (applicable large employers) must offer health insurance. Whether or not you’re considered an ALE generally depends on the size of your workforce from the previous year. This means that the health coverage you offer in 2018 depends on the number of employees you had in 2017. How do I know if my business is an ALE? Only businesses of a certain size are considered ALEs, and are therefore required to offer health insurance to their employees. In order to be considered an ALE, your business must have employed an average of at least 50 full-time employees during the previous calendar year, including full-time equivalent (FTE) employees. In order to determine the number of full-time workers your business employed, add your total number of full-time employees from each month (including FTE employees) and divide that number by 12. If the result is greater than or equal to 50, your business is considered an ALE, and must offer health insurance to employees. What’s the difference between a full-time and a full-time equivalent employee? When determining the number of full-time workers your business employs, you must count the number of traditional full-time employees as well as FTE employees. A full-time employee is anyone who is employed an average of 30 hours a week for each week during a calendar month, or at least 130 hours of work during the entire month. To calculate full-time equivalent staff your business employs, add the total number of hours worked by all non-full-time employees during a calendar month, without going over 120 hours of work for any single employee. This means that if one part-time employee worked 150 hours during one calendar month, the employer must only count up to 120 hours of work. Once you’ve added all of the part-time hours without exceeding 120 for any one employee, divide the total number by 120. The result is the number of FTE workers you employ. Add this total to the number of traditional full-time workers you employ. If that total is 50 or higher, your business is considered an ALE, and you must offer health insurance to your employees. Are there any exceptions when determining if your business is an ALE? Yes. There are a few exceptions for the types of employees a business counts when determining if it’s an ALE. If your business employs more than 50 full-time employees (including FTE employees) for 120 days or less during the previous calendar year, and all employees past the fiftieth during that period are seasonal workers, those employees are not counted toward ALE consideration. For example, if your business normally employs 49 full-time workers, and you hire 10 more people to help during the holiday season, those 10 extra employees will not count toward ALE consideration as long as they’re only employed for 120 days or less. Any employees who have coverage under TRICARE or another Veterans Administration health program are similarly not counted toward ALE consideration. What else should I know about ALE determination? New businesses with no past employment data are considered ALEs if they’re “reasonably expected” to employ at least 50 full-time workers during the current year. If your business starts with less than 50 full-time employees, but you hire more during the calendar year, the total number of employees throughout the year will be used to determine your business’s standing as an ALE for the following year. 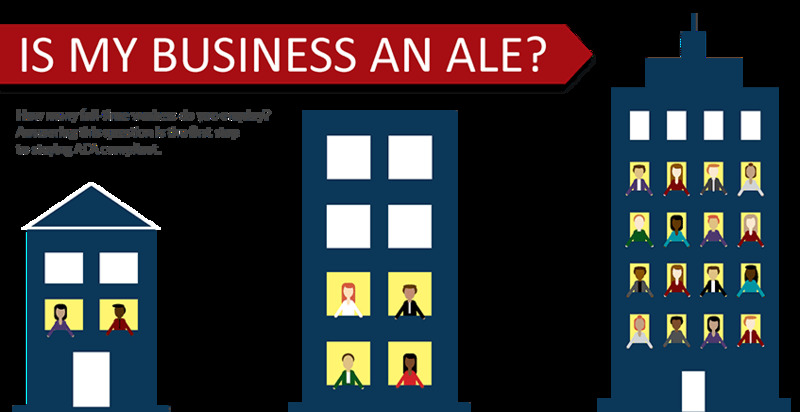 ALEs can be made up of a single business or a group of businesses that share a certain level of common ownership. Each business that’s part of a collective ALE group is considered an ALE member. 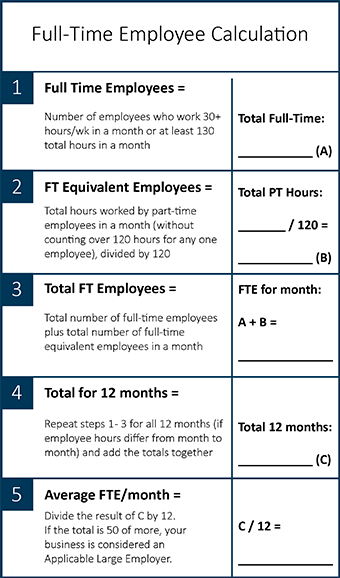 When determining the number of full-time employees, ALE groups must count the total number of full-time employees (including FTE employees) for all member companies to calculate total service hours.